Gadolinium-based contrast agents (GBCAs) are essential to MRI body imaging. The images they produce help detect and characterize tumors and detect inflammation and fibrosis. They enable organ perfusion to be assessed and vessels to be delineated. However, the majority of GBCA use for body imaging is off label, because the U.S. Food and Drug Administration has approved most of these agents only for central nervous system imaging. Nonetheless, GBCAs represent a crucial component of most abdominopelvic scanning protocols. GBCAs cause a prominent T1 shortening effect and also some T2 shortening. Body imagers are looking for T1 enhancement, which is best shown on T1-weighted images. It is essential that body MR imaging be safe, fast, comprehensive, and sensitive to pathology. Image quality, reproducibility of image quality, and good conspicuity of disease require sequences that are reliable and resistant to artifacts. Sequences that we routinely employ are the hepatic arterial dominant phase (aka the late hepatic arterial phase), the early hepatic venous phase (aka the portal venous phase), and the interstitial or equilibrium phase that is acquired in both the transverse and coronal planes (Figure 1). A normal capillary blush shown by the adrenal gland. I evaluate all these features to determine whether the timing of contrast administration is correct, and to evaluate pancreatic disease or other diseases by assessing the capillary phase. This exercise enables me to focus on lesion detection, especially hypervascular lesions such as metastases and hepatocellular carcinomas. I also look for perfusional abnormalities in the liver. If a normal pancreas doesn’t enhance more than the liver, this is a possible indication of chronic pancreatitis, diabetes, or sustained hypertension. Images from the early hepatic venous phase (the portal venous phase) show the enhancement and level of brightness of both the portal veins and the hepatic veins. This helps distinguish portal veins from a variety of focal liver lesions. In this phase, the capillary blush has been lost, and the pancreas fades to the background, exhibiting the same signal as the liver. This phase is used for detection of hypovascular lesions and characterization of lesions. Hypervascular lesions may show fading or washout, whereas the vessels should be retaining contrast at this phase. It is possible to identify thrombosis of hepatic veins and portal veins, and benign lesions such as focal nodular hyperplasia, which fade. 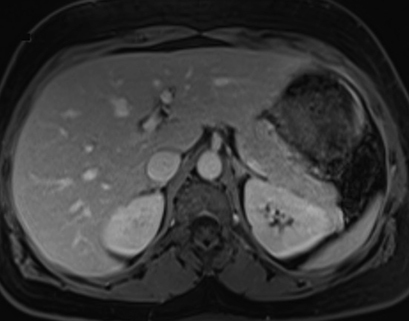 Washout can also be associated with malignancy, the classic lesion of which is hepatocellular carcinoma. When interstitial phase images are combined with fat suppression images, they resemble CT images. They can be useful for lesion characterization. 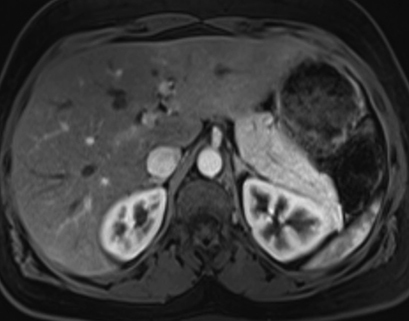 For example, cholangiocarcinoma is displayed as a continued progressive enhancement of the malignancy in images of the entire abdomen and pelvis. Images acquired from the interstitial phase are also very useful to identifying peritoneal disease. The normal peritoneum should be 2 mm or less. If it has a measurable thickness of 2 mm or more, the beginning of the disease process can be diagnosed. Other clinical applications of the interstitial phase sequence include the identification of retroperitoneal lymph nodes, bowel abnormalities, and screening for bone metastases throughout the entire abdomen and pelvis. In fact, MRI is vastly superior to CT for identifying bone metastases. With the introduction of new GBCAs, it is critical to determine whether to employ one of the new contrast agents and to evaluate how it compares to current contrast agents. If this is done in a blinded manner so that neither the radiologic technologist nor the interpreting radiologist is aware which agent is being used, it may be possible to avoid the Weber Effect and the Lalli Effect. The Weber Effect is the awareness by patients and technologists of the introduction of a new drug being evaluated and its potential adverse effects that may make them more acutely aware of adverse effects, however minor, and over-report them. The Lalli Effect is the induction of more adverse effects in patients who sense the anxiety of the healthcare professional, generally the technologist administering the exam. A blinded study eliminates these potential biases. It should include blinded evaluation of the presence and type of acute adverse events, blinded assessment by a radiologist of image quality enhancement, and quantitative percentage of organ enhancement, choosing a temporally, tightly-defined phase of enhancement. The best studies are crossover studies in which both agents are administered to a subject in a relatively short time frame, typically within a week of each other. However, a crossover study may be more difficult to implement and poses the risk of administering two GBCAs to an individual in a relatively short time. Intra-individual studies are similar to crossover studies but eliminate risk, are easier to implement, and provide similar clinical data. At the University of North Carolina, we conducted an inter- and intra-individual comparative study of MultiHance® and Dotarem® to assess the rate of adverse events in combination with inter- and intra-individual determination of qualitative and quantitative enhancement properties.1 We used visual and region-of-interest measurements, and a tightly defined phase of contrast enhancement—the hepatic arterial dominant phase—to increase the reproducibility and accuracy of our findings. Population 1 represented 41 patients who received Dotarem for their exam and a control group of 46 patients who were scanned with MultiHance, our standard contrast agent, over the same 30-day period of time. Population 2 represented 27% of the patients who received Dotarem but who also had undergone an MRI scan with MultiHance during the previous 18-month period. The study confirmed that Dotarem performed comparably to MultiHance. Image quality was good for both agents. There was a significantly higher percentage of liver enhancement with MultiHance (p<0.0001), and a trend toward a higher pancreas-to-liver enhancement with Dotarem, significant in p=0.0333. Of the 114 patients scanned with Dotarem, only one suffered a mild acute event of vomiting. The benefit of data accrual like this is that it is modular in nature and can form part of the basis of safety and quality assessments of agents already in use and new agents. Focal nodular hyperplasia (Figure 2.) These images depict a case of FNH with a typical mildly hyperintense appearance on T2-weighted imaging, minimally hypointense on T1-weighted imaging. A small scar is apparent; minimally hypointense on noncontrast T1-weighted imaging with fat suppression, intense enhancement with a cotton wool-type appearance with minimal enhancement of the central scar. There is fading of the lesion and progressive late enhancement of the central scar. 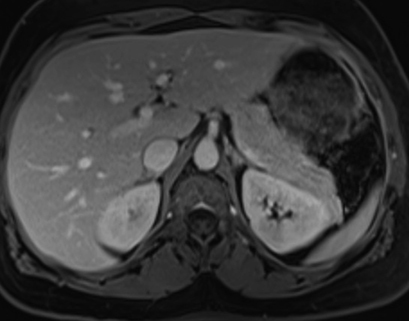 Pyogenic liver abscess (Figure 3.) On T2-weighted imaging, these images depict a case of pyogenic abscesses, which shows surrounding edema, a thick wall, air in the nondependent portion of the lesion, and debris in the dependent portion. The noncontrast, T1-weighted, out-of-phase image displays the thick wall and dark signal void in the nondependent position. The arterial phase shows the blush of enhancement around the lesion, which has to be present in a well-timed phase with no contrast in hepatic veins and contrast in all the other vessels. This is an optimally timed phase. Myofibroblastic tumor (Figure 4). 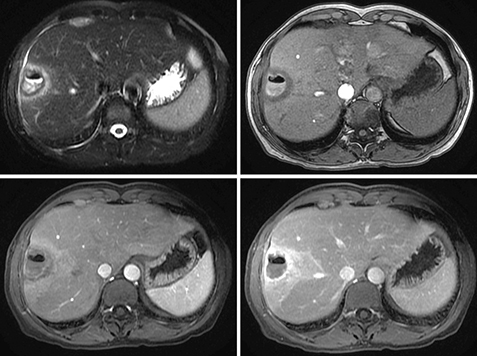 These images depict a case of myofibroblastic tumor, which appears as an oval-shaped subcapsular lesion with a mildly hyperintense appearance on T2-weighted imaging and a minimally hypointense appearance on T1-weighted imaging. It shows early perilesional and minimal lesional enhancement with progressive enhancement and retention of gadolinium in the lesion on subsequent phases. The benefits of gadolinium-based contrast agents are so great that they are routinely included in almost all body MRI applications. Adherence to safety guidelines has virtually eliminated the occurrence of new NSF cases associated with GBCAs. Indeed, MR imaging with gadolinium is vastly safer than CT imaging with iodinated contrast. However, it is important to avoid repeated doses of gadolinium, and, whenever possible, to use gadolinium contrast agents with the best safety profiles. The radiology department at UNC uses a range of agents, primarily MultiHance, but we are also ramping up our usage of Dotarem. Shin KS, Al Obaidy M, Ramalho M et al. Inter- and intra-individual comparison study of two gadolinium-based agents: A pilot study. Abdominal Imaging. Published online Sept.16, 2014 (doi:10.10.1007/s00261-014-0248-0). Utilization of GBCAs in MR body imaging applications. Appl Radiol. Dr. Semelka is a Professor, Director of MRI Services, Vice Chairman of Clinical Research, and Vice Chairman for Quality and Safety of the Department of Radiology at the University of North Carolina Hospitals, Chapel Hill, NC.